The “Insular ribbon sign” is one of the early signs of acute MCA territory infarction. In a set up with both CT and MRI, CT still remains the first imaging modality for initial evaluation of patients with suspected stroke. Lesions that clinically can mimic ischemic stroke, such as hypertensive hemorrhages tumors complicated with bleed, complicated vascular malformations, and are to be excluded first. Once bleed is ruled out then pt can be subjected to MRI diffusion and other sequences to rule out acute stroke. 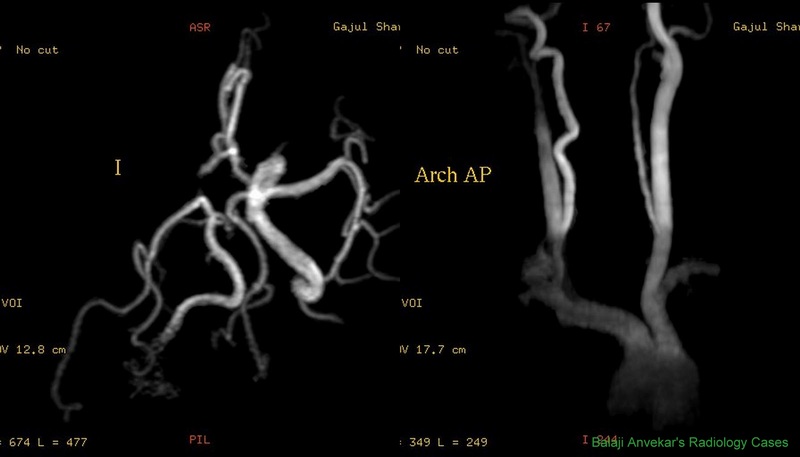 This is a protocoal for stroke we follow. Reasons are cost effectiveness, less time consuming, suitable for non co operative patients, easy availability and relative familiarity of CT to the doctors on duty. Most CT scans are negative in acute infarct in the first 6 hours after symptom onset. However, several subtle parenchymal findings like insular ribbon sign can be sometimes seen and should be searched for. The "insular ribbon sign" corresponds to blurring of the gray - white matter inter phase due to decreased attenuation of the gray matter which has undergone ischemia with an associated cytotoxic oedema where normally the insular cortex and lentiform nucleus have slightly higher attenuation than the intervening external capsule. CT attempted first, hypertensive bleed ruled out. Considering history of recent onset left sided weakness, there is subtle low attenuation of right insular region - insular ribbon sign positive. Immediate MRI Diffusion shows acute right MCA territory infarct, there is hardly any change on FLAIR except mild effacement of cortical sulci. 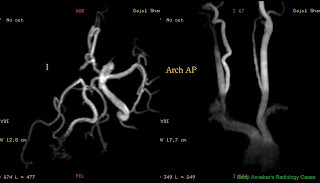 MR Angiography of brain and neck show right MCA - ICA occlusion.